Popular Japanese author and designer Yoshiko Tsukiori brings unique new designs and style to the do-it-yourself sewist that make it easy to create the kind of clothes little girls adore. 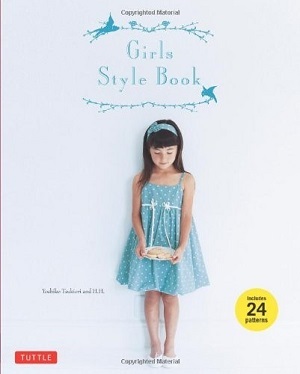 Japanese Sewing book Girls Style Book (in English) offers 24 full-sized patterns in five sizes for some of the cutest dresses, tops, outfits and accessories for girls from ages 4-10. Already loved by aficionados of Japanese fashion, this book has something for every girl's taste: relaxed, comfortable clothes that are as fun to wear as they are to look at. Projects include a wide variety of DIY-sewing dresses, tops and pants. The patterns can be adjusted to suit your little girl's shape and size. Clear, concise diagrams and instructions make these children's clothes so easy to sew, the hardest part will be deciding what to make first! There's nothing quite like dressing your little girl in clothes she adores—made with love, made by you.